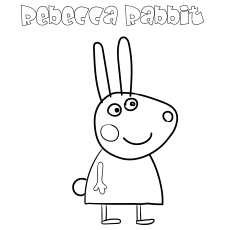 “Peppa Pig” is a preschool animated television series produced by Ashley Baker Davis. 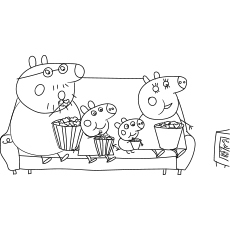 The show revolves around Peppa, an anthropomorphic female pig and her life with her family and friends. The characters of this television series live in houses and drive cars, but still display some characteristics of the animals they are based on. 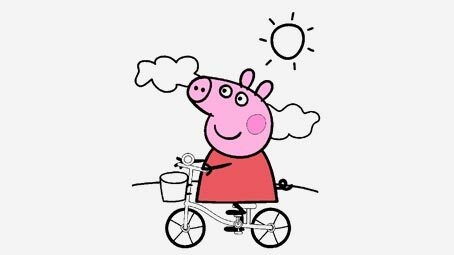 Each episode features the everyday activities of Peppa Pig, like swimming, visiting the grandparents, cousins, attending play school or riding bikes. 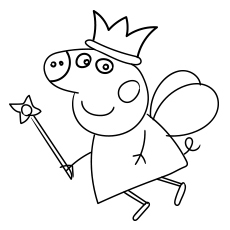 Now that you have learned some interesting facts about this series, it is time to head to the Peppa Pig coloring pages free to print. 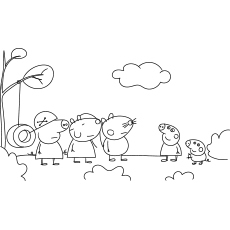 Here is a small collection of Peppa Pig coloring sheets for young ones. 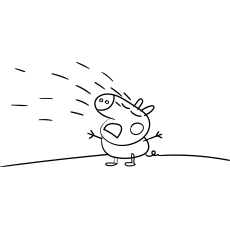 Meet Peppa, the protagonist of the series. 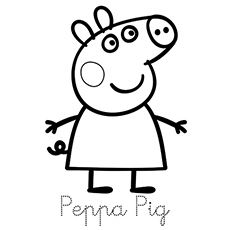 Peppa Pig is a six-year-old female pig who lives with her mother, father and little brother George. She spends her time playing with her best friend Suzy Sheep. 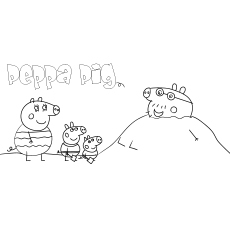 Peppa loves jumping in the mud puddles, laughing and making loud snorting noises. 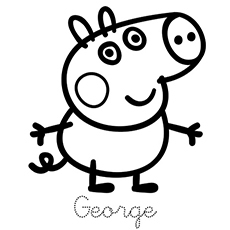 This is George, Peppa’s little brother. He is a 2-year-old male pig who loves to play with this elder sister. George is very fond of toys, especially dinosaur, and carries it everywhere with him. In fact, “Dine-saw!” was the first word that George ever uttered. George enjoys eating and laughing the most. George is a pink-skinned pig with a small, curly pint tail. He is shown wearing a blue shirt in the television series. 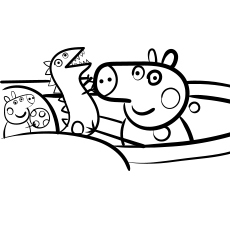 Here is a coloring sheet of Mummy Pig. 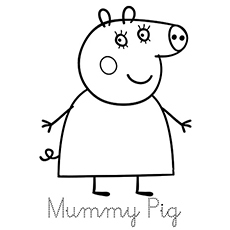 Ask your child to trace the words “Mummy Pig” after they are done coloring the sheet. Her real name is Amanda Pig. 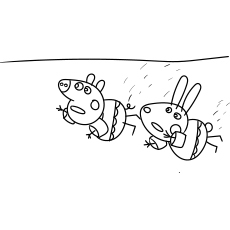 Mummy Pig, just like Peppa, loves jumping in the mud puddles. She is a wise and intelligent pig. She is better at reading maps than Daddy Pig. 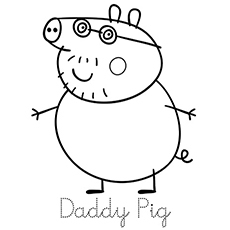 Daddy pig is a jolly fellow and laughs all the time, especially when he plays with his children. However, he gets a little grumpy at times, especially when he loses his spectacles. 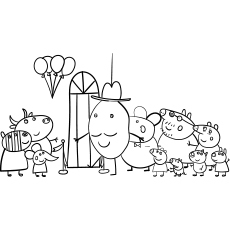 Daddy Pig works as an architect. He loves chocolate cookies and cakes and can never give up on them. He is a light turquoise pig and has a brown mustache. He is shown wearing a dark turquoise dress in the show. 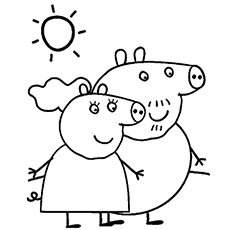 Here is an adorable coloring sheet of Peppa’s Granny and Grandpa. Explain the importance of grandparents in a child’s life with this coloring sheet. 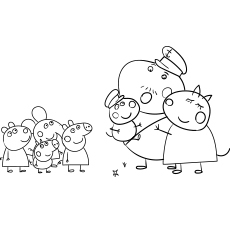 Granny Boco Pig is a caring grandmother and loves all her grandchildren equally. 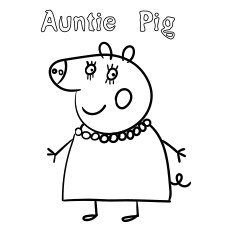 She is a pale pink-skinned pig and wears a pink dress and black shoes. Grandpa is very passionate about gardening. He allows Peppa and George to help him in the garden. He has pale pink skin and is shown wearing indigo shirt and black shoes. 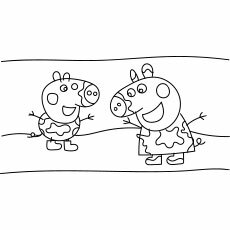 Here is a coloring sheet of Peppa with Jase pig, her younger sister. Jase is a baby piggy who wears a pink pensie with white dots. Blue pillow is Jase’s favorite toy. She loves having cheese chips and milk. 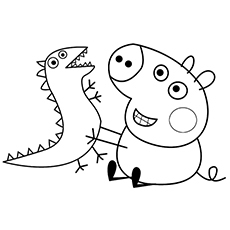 Here is a coloring sheet of Alexander, Peppa’s cousin, playing with the Big Lizard. His favorite color is yellow and he always wears a yellow dress just like his sister Chloe. Alexander is a baby pig who is still learning how to speak. He can only say words like Goo Goo and puddles. 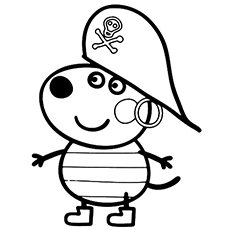 This is a coloring sheet of Danny Dog dressed as a pirate. Danny is a secondary character of this show. He is a close friend of Peppa Pig. Danny is a dog with a good imagination. He is very good at acting and is always on the move. Danny is a dark brown dog with short ears and nose. He wears a purple shirt in the show. 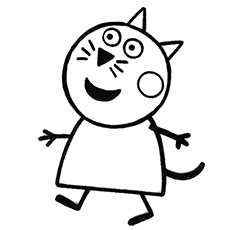 Here is a coloring sheet of Candy cat waiting to be colored. Candy wears a turquoise dress in the show. Ask your child to use this shade for this adorable cat. Candy is also a close friend of Peppa Pig. Her typical sound is Meow. She is known to imitate the tigers, as tigers are the big cats. 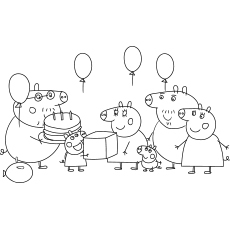 Here is an adorable coloring sheet of the Pig family taking dinner together. 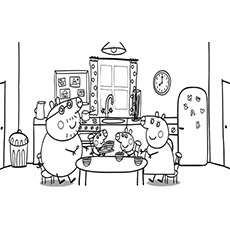 The coloring sheet shows a happy family sharing and enjoying the company of each other over a warm meal. This coloring sheet will also get your child in the mood for a healthy snack. 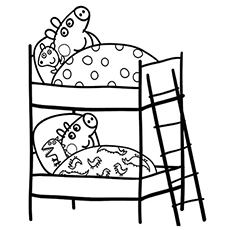 This coloring sheet features Peppa and George taking a nap on their bunk bed. George loves his stuffed dinosaur so much that he does not part with it even while sleeping. The coloring sheet highlights the bond a sister shares with her brother. 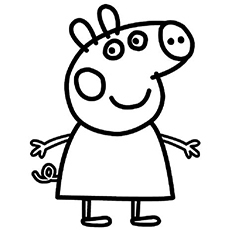 This is a coloring sheet of Chloe, Peppa’s cousin. She is Alexander’s elder sister. Chloe is around two years older than Peppa. This pink skinned pig is always shown wearing a yellow dress in the series. 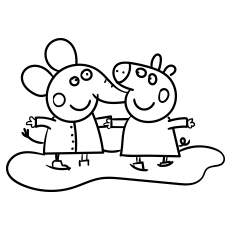 Chloe and Peppa share a healthy relationship in the series. Peppa always comes to Chloe whenever she faces any problem. 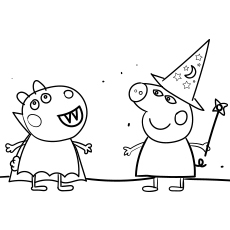 This coloring sheet shows Peppa helping Mummy Pig with her work. 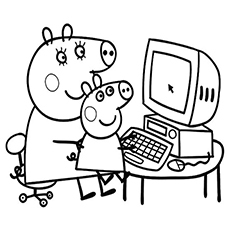 Mummy Pig works from home on her computer with the help of Daddy Pig and George. Teach your older child some basic of computers after coloring this sheet. 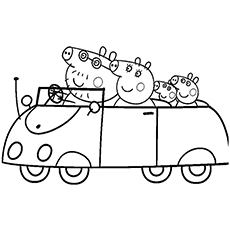 This coloring sheet shows the Pig family going for an outing. Where do you think they are heading? Make up a story in your mind while your child colors the sheet. 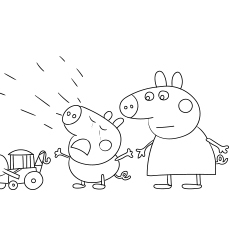 Daddy pig loves taking his family on car trips. He makes it a point to go on a road trip every weekend. 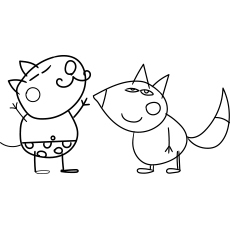 Your child will surely enjoy coloring this cheerful family. It will help him with his fine motor skills too. 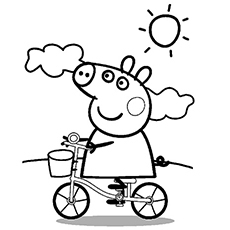 Looks like Peppa is totally enjoying cycling on a sunny day. This coloring sheet, with its beautiful landscape, will allow your child to showcase his artistic abilities. Cycling is also a great form of exercise. Explain more about this exciting sport to your child while coloring this sheet. You can also take some time out to go cycling with your kid after coloring this sheet. 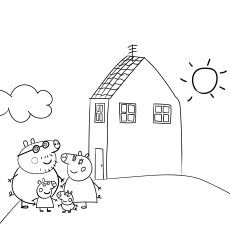 These free printable Peppa pig coloring pages online will aid in your preschooler’s social and emotional development, like building self-esteem, empathizing with other and expressing feelings. 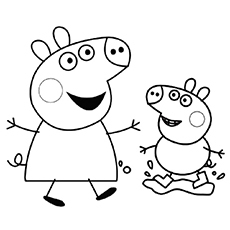 We hope your kids enjoy coloring Peppa Pig coloring pages printable. Do share your views with us.